Treating toenail fungus(“onychomycosis”) has always been a tricky issue for even the best specialists despite the fact that it’s the most common nail disease out there and is estimated to affect almost 40 million people from all walks of life in the United States alone. Thankfully, there’s a new and better way to effectively treat this common problem. 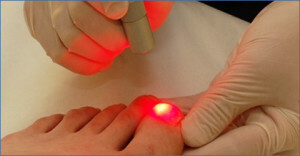 Laser toenail fungus treatment is a quick process and is the only FDA – cleared laser application for the effective treatment of nail fungus (onychomycosis) for all individuals.